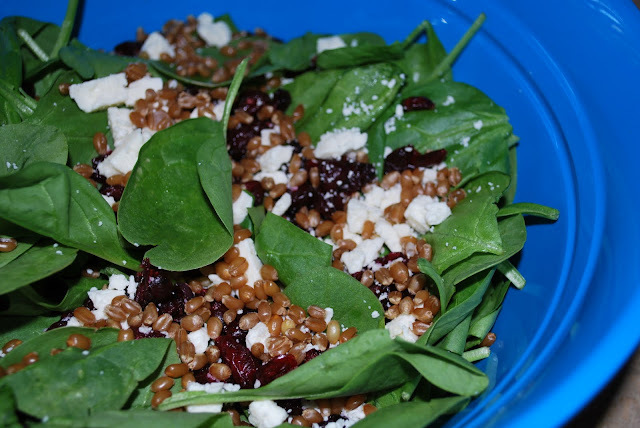 This salad is super easy, especially if you cook up the wheat berries ahead of time. We like to cook a large batch of the wheat berries and then freeze them for moments just like these. We always have them ready to throw in a recipe! Not sure how to cook wheat berries? Click here. Directions: Place all of the ingredients in a large bowl and toss gently. Add salad dressing if you wish. The wheat berries give you the crunch that croutons would, only they are much healthier for you.